Tanner Holden’s one handed catch from Makya Matthews halfback pass helped Wheelersburg set up one of their first half scoring drives. Jalen Miller made a 28 yard field goal as time expired in the first half to give Wheelersburg the 24-6 lead heading into halftime. 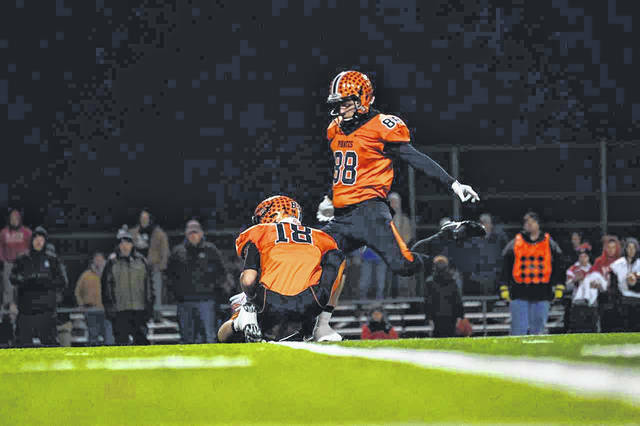 Chase Stidham caught Evan Horsley’s fake punt pass in the first half of Wheelersburg’s regional final game vs. Middletown Madison Saturday night in Hilliard. Makya Matthews end around run helped set up Evan Horsley’s one yard touchdown run, the Pirates first of the game. 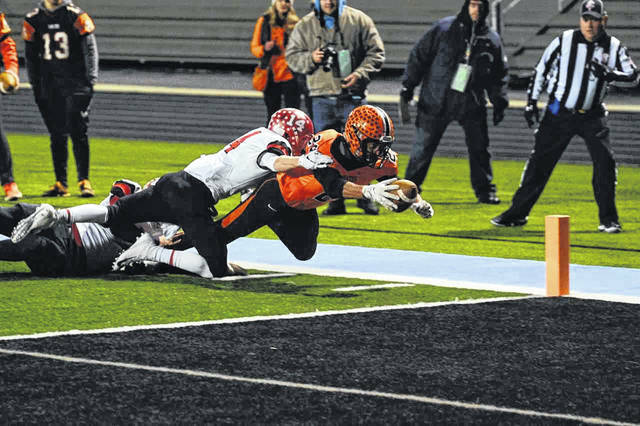 For the third time in four seasons, the Wheelersburg Pirates will be going to the state semifinals after they were able to hold on and defeat the Middletown Madison Mohawks 24-16 in an incredibly physical football game held at Hilliard Darby High School Saturday night. The game opened up with neither team being able to establish any footing offensively, until on the Mohawks second possession of the game, facing a fourth and one from the Wheelersburg 45 yard line, Madison did something they are not known for: they threw the ball. Mohawk senior quarterback Mason Whiteman found a wide open Noah Lehman on a play action pass to give Madison the lead 6-0 with 2:59 left in the first quarter after the Mohawks two point conversion attempt was unsuccessful. Although Wheelersburg happened to give up the long touchdown, something they haven’t necessarily done throughout their season up to this point, it would prove to be the only offensive points Madison would score, an incredible testament to the strength of this Wheelersburg defense. 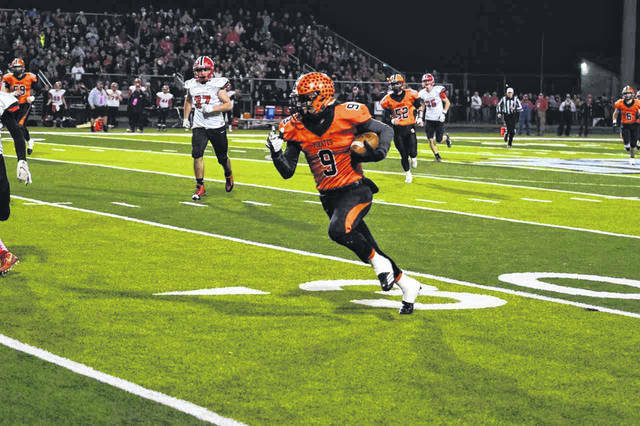 Wheelersburg’s first offensive touchdown of the night came in the early stages of the second quarter at the 9:39 mark when Evan Horsley crossed the goal line on a one yard touchdown rush to give the Pirates the 7-6 lead. The play was helped set up by a fake punt pass from Horsley to Chase Stidham, and an end around run by Makya Matthews. The offensive fire power wouldn’t stop there, however. On the Pirates next possession, Trent Salyers passed to Matthews in the backfield, who then threw the ball to a covered Tanner Holden who bobbled the ball before completing the catch at the Madison 25 yard line. A few plays later, and a couple of key cuts later, Matthews crossed the goal line for a 14 yard touchdown rush to extend the Pirates lead to 14-6. After an excellent defensive series, a theme throughout the contest, Salyers found Matthews on a perfectly placed ball for a 50 yard touchdown pass to extend Wheelersburg’s lead to 21-6 with just 1:42 left in the first half. But they weren’t done yet. Wheelersburg forced a three and out on the Mohawks ensuing possession, and on the punt return, Madison was called for two unsportsmanlike penalties. This gave the Pirates the ball on the 15 yard line of Madison. Although they were not able to find the endzone with short field, senior Jalen Miller nailed the 28 yard field goal as time expired in the first half to give the Pirates the 24-6 lead heading into the break. While momentum was favorably on the side of Wheelersburg, things would change very suddenly coming out of the halftime break. On their second possession of the half, Salyers was called for intentional grounding in the endzone, giving Madison a safety to cut their deficit to a two possession game at 24-8 and about to receive a free kick. Just when things seemed not so great, they quickly turned to bad. On the ensuing free kick, the recipient of the 45 yard touchdown reception in the first half, Noah Lehman, proceeded to return the kick all the way into the endzone for Madison’s second score of the game. Following Whitman’s successful two point conversion attempt, Madison was only down one score at 24-16 with 7:22 left in the third quarter. As Woodward mentioned, however, his defense came to play for the rest of the game and did not allow another point, including when Madison was on the five yard line with just ten seconds to play. Once again, this Wheelersburg team stood tall, their defense played an incredible game, and that is the reason the Pirates will be playing in the state semifinals for the third time in four years, defeating Middletown Madison 24-16. In week fourteen, two words sweet to Pirate fans, Wheelersburg will face Johnstown Monroe at Jackson High School next Saturday night at 7:00 p.m. with a bid in the state championship game on the line. 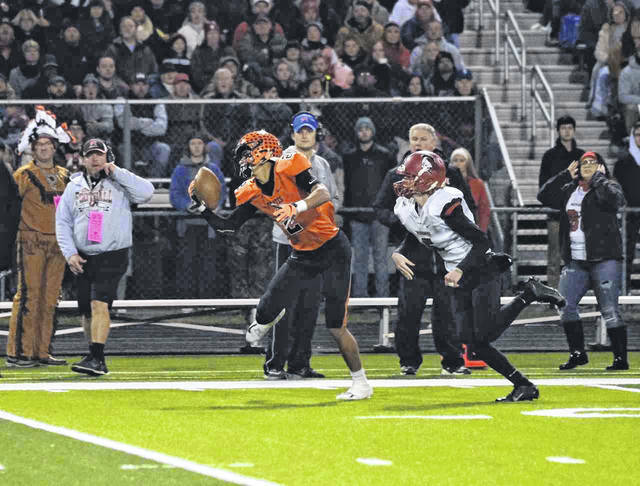 In last season’s regional final matchup between Wheelersburg and Johnstown Monroe, the Pirates prevailed 34-7 in route to the school’s second state championship win.